Home tattoo removal is a controversial subject. There are many sites listing ways that are ‘safe’ but if you look at many other sites suddenly you can find all sorts of side effects. Certainly trying to remove a tattoo yourself at home is risky. TCA which stands for Trichloroacetic acid is another commonly used method. It works by generating an inflammation on the surface of the skin around the tattoo, after a couple of weeks this skin will peel off. As you can see simply you are applying acid to your skin, the skin peels off and new skin will replace it. You have to apply this acid every 6 weeks for quite a long time to see results in removal of the tattoo. Dermabrasion involves sanding off the unwanted skin! You sand until it bleeds then wait for the area to heal over and then repeat over and over. As you can imagine this is not at all a recommended process, it is easy to get infections and you are guaranteed to leave scarring. Excision is simply cutting out the tattoo and sowing the skin back together again. Unbelievably people do try this themselves at home. Again simply you are leaving yourself very vulnerable for infections in the area and you will be left with scarring. This method especially will leave you scarred as without a professional I doubt you can stich yourself up very well. 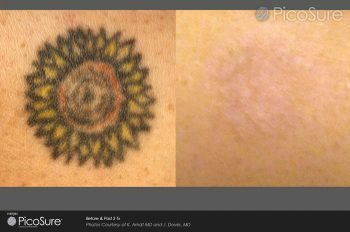 So these are the most common home tattoo removal methods and I would urge you to stay away from any of them. Book yourself in with a professional, cough up some money and watch the results come in. Professional laser treatment at least has no side effects!